This works and it’s very easy. 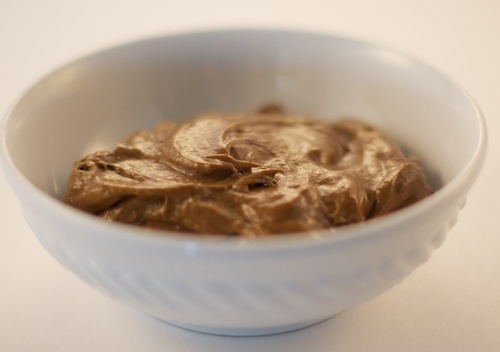 It’s a relatively low-sugar vegan pudding or frosting made with just a few ingredients: avocado, banana, dark chocolate, and vanilla extract. Dark (bittersweet) chocolate has far less sugar than sweet chocolate, it’s more chocolatey but less sweet. The higher the cocoa content, the darker and more bitter the chocolate. I have used Cordillera 70% cocoa bittersweet chocolate discs in this recipe and I’ve used sweeter dark chocolate chips. Both worked but I preferred the Cordillera. While you could skip the refined sugar altogether by using cocoa powder instead of chocolate, cocoa powder alone is too bitter for me, and with a natural sweetener like dates or maple syrup the result tastes too much like the sweetener and not enough like chocolate. For all its evils cane sugar has a neutral flavor that works well in recipes, so if you do sub cocoa powder for the chocolate, 3 Tbsp. cocoa powder and 2 Tbsp. powdered sugar will work. I still prefer the recipe with chocolate, I suppose I prefer the extra fat from the cocoa butter. Part of my problem may be that I haven’t found an ethically sourced cocoa powder that I really like. If you have a favorite one let me know. This recipe is meant as a base for you to enhance as the mood strikes you or to include as a part of a larger recipe. By itself it’s a little bland. I like it with a little cinnamon and whiskey in it to jazz up the flavor. Kahlua is also excellent here, as is chocolate liquor (either will add a little more sugar). Chopped salted pistachios on top are good and I’ve found that Dang Caramel Sea Salt Coconut Chips on top are excellent! Earlier this week I served this with sliced mangoes and a date/pistachio crumbled topping that I whipped up in the food processor. I don’t bake a lot so I haven’t yet tried it as a layer or frosting in baked goods, but I’m imagining it will work fine for me there. Obviously as a frosting this will be less heavy and sweet than a palm oil or butter/confectioner’s sugar frosting, and as a pudding it’s going to be much lighter than one made with egg yolks and cream or coconut milk. If chocolate is not already in rounds (as in couverture rounds, or chips) break it up a little. Place in bowl. I melt chocolate using the microwave method. Zap for about 1 minute, stir, zap again for 30 seconds, stir, give it a minute to finish melting. If it needs an additional 30 seconds, zap again. The amount of microwaving needed will vary with your machine. 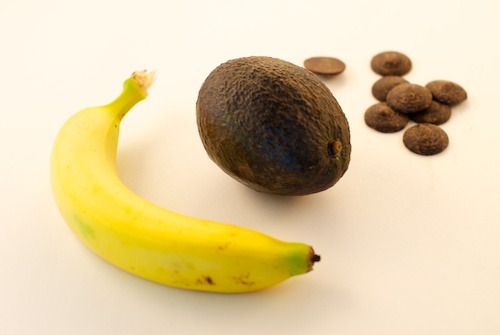 Blend avocado and banana in your blender or food processor. Add melted chocolate and vanilla and blend again. Add a tiny bit of salt (optional). Add optional flavoring(s) if desired. Cocoa Cherry Energy Bars Quick chocolate cherry energy bars for the road or trail. 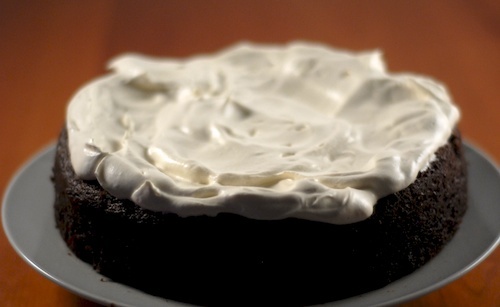 Chocolate Porter Cake This striking black Chocolate Porter cake with a white whipped cream topping features an inspired flavor combination of cocoa and dark beer. Yum! 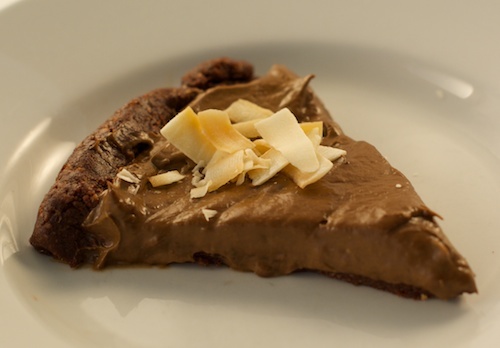 I make a vegan chocolate pudding/frosting too, only I use coconut cream, cocoa powder, powdered sugar and vanilla extract. I’ve got to try your version sometime! Coconut cream is sooo good, I’m sure it makes a killer frosting. I have a jar of Artisana Coconut Butter in my fridge, that stuff is manna. This is certainly quick when you need something NOW. I love the idea of a frosting. It is quick…. and I keep making it. Had it tonight as part of a chocolate pudding pie. The crust was date/ground oats/almond meal and I topped it with the Dang! caramel sea salt coconut chips. I’m will try your recipe. 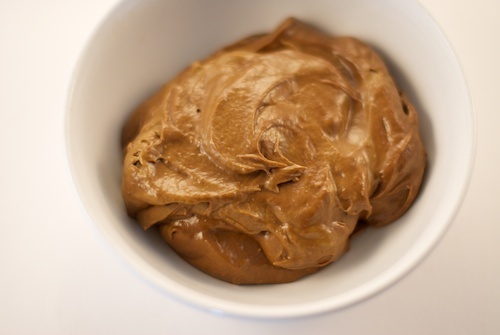 I made a chocolate/avocado pudding of this type and almost gagged on it. I couldn’t understand why people thought it was so good. Maybe it was just not the right combination of ingredients that I was using, I don’t know. Your frosting is miles better than traditional frosting so it’s worth another try. Let me know how you like it and any variations that you add!